SYDNEY — Halfback Nick Phipps and blindside flanker Lukhan Tui will start for Australia in the Wallabies' series-deciding test against Ireland on Saturday. Rugby Australia said Thursday that 63-test veteran Phipps would replace the injured Will Genia, while Tui's promotion forced David Pocock to move to No. 8 where he will replace the dropped Caleb Timu. They were the only changes to the starting lineup made by coach Michael Cheika. 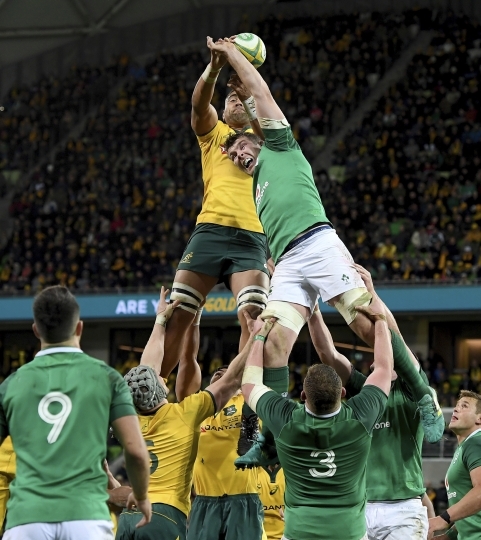 Genia sustained a broken right arm in the second test won 26-21 by Ireland in Melbourne. Australia won the first test 18-9 in Brisbane. Joe Powell could add to his three test caps after being named on the bench as reserve halfback, along with 2017 Wallabies rookie of the year Ned Hanigan, who returns from a knee injury. Ireland made five changes, including in the front row where Jack McGrath and Sean Cronin will partner Tadhg Furlong. In the second row, James Ryan and Devin Toner pack down again while the back row has a new look with Jack Conan coming in at Number 8, C.J. Stander switches to 6 and Peter O'Mahony moves to No. 7. Injuries to winger Andrew Conway (hip), openside flanker Dan Leavy (sternum) and center Garry Ringrose (foot) forced three of the changes. The halfbacks pairing of Conor Murray and Johnny Sexton will be joined in midfield by Bundee Aki and Robbie Henshaw. Jacob Stockdale returns to the back three alongside Keith Earls and Rob Kearney. The uncapped Ross Byrne was named in the reserves, as was Tadhg Beirne, who made his debut last week in Melbourne. Cheika promised the Wallabies will be attack-oriented. "I think we'll be less conservative, you can't win finals without scoring tries and playing footy," Cheika said. "I'm a true believer in that. They did well last week to restrict us from doing that and we'll be looking to try and open up this weekend for sure." Australia and Ireland last played in Sydney in 1994, when the Wallabies won 32-18 at the Sydney Cricket Ground. Saturday's decider will be played at the 45,000-seat Sydney Football Stadium, and Rugby Australia said the match is a sellout. 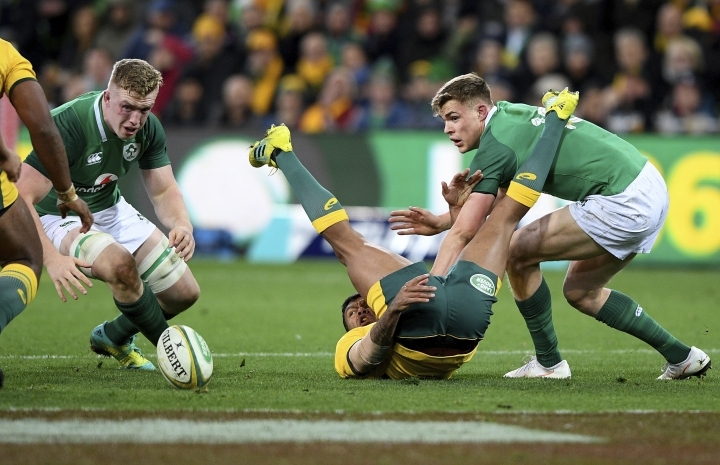 Australia: Israel Folau, Dane Haylett-Petty, Samu Kerevi, Kurtley Beale, Marika Koroibete, Bernard Foley, Nick Phipps; David Pocock, Michael Hooper (captain), Lukhan Tui, Adam Coleman, Izack Rodda, Sekope Kepu, Brandon Paenga-Amosa, Scott Sio. Reserves: Tolu Latu, Tom Robertson, Taniela Tupou, Rob Simmons, Ned Hanigan, Pete Samu, Joe Powell, Reece Hodge. Ireland: Rob Kearney, Keith Earls, Robbie Henshaw, Bundee Aki, Jacob Stockdale, Johnny Sexton, Conor Murray, Jack McGrath, Sean Cronin, Tadhg Furlong, Devin Toner, James Ryan, C.J. Stander, Peter O'Mahony, Jack Conan. Reserves: Niall Scannell, Cian Healy, John Ryan, Tadhg Beirne, Jordi Murphy, Kieran Marmion, Ross Byrne, Jordan Larmour.